Before using images from your camera – well, almost anywhere: website, e-mail, even Word or PowerPoint – you usually need to resize them. 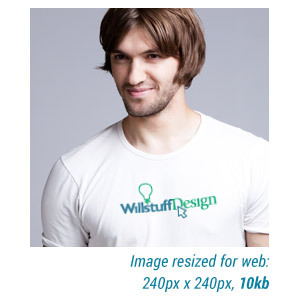 Most applications allow you to adjust the size of how an image appears in your document, but it is still using the full resolution file, which can be quite large – usually much larger than it needs to be. In this case, the image is being used at 240×240 pixels — which saved as a medium quality .JPG would make the file size about 10kb. However, if an image is used straight from a camera or master file – which could easily fill a large screen – it is still being downloaded in its entirety – possibly over 2-3MB – just to be viewed at this small size. Here are some numbers: an average camera can easily take a photo that is 4800 x 3600px, which is great for printing posters, or zooming in full screen on a large display. But if this same image file is used in a web page or e-mail, say at a very usable 480 x 360px, without using a smaller copy, everyone could be downloading many megabytes of detail they’ll never see. This can add up to actual dollars for someone on a limited data plan smart phone, or having e-mails get blocked because of attachment file size limits. If you can wrap your head around the idea that file size is money – which ultimately it is – this is a savings that can and should be made. Just Google “easy image resize” and choose a method to speed up your web pages and e-blasts, reduce bandwidth drains, and minimize unnecessary disk space clutter.